Next Friday, May 17, I'll have my last radiation, so fingers crossed my energy will return and I can start writing again! Just a quick note to thank you for the support, virtual gifts and interest. Today I had radiation treatment number 12, so 18 of those to go. It's a combination with chemo. It's officially still experimental and it's an American discovery and so far the only treatment that actually manages to slow down the type of brain tumour I have. Glioblastoma, to be exact. So I like to think the spirit of our beloved Dr. Reid is trying hard to give me the best change. Collecting my thoughts is getting better and I've done some writing, but no fiction. Updates like this on Facebook mainly. To share this whole process, because it's quite a ride. We have to drive to hospital every weekday, so that's putting a toll on the energy. As does the treatment itself, obviously. But I'm doing okay. We focus on celebrating life and on enjoying what we do have. Counting our blessings and there is a lot to be grateful for. My body is coping. All organs keep functioning, so basically we can continue with the current treatments and that's good news. This road is paved with all kind of unexpected gifts, so I truly feel blessed. First round of Treatments will end mid November and new scans will then show if this tumour is still the same threat. Biopsy result. it's not good. It's bad. Very bad. It's the most aggressive one and an operation is - due to the location of it - not an option. So they're gonna hit it with radiation and chemo to slow it down. Making it disappear is not possible with this kind of tumour. Slowing it down is the best they can do.Obviously we're completely devastated. But there's also this strength I feel. It's still not a battle. But I'm not gonna let this tumour dictate my life. I'll stay foced on life, on love, on joy and on making my heart sing and my soul dance. I'm gonna celebrate my life as long as I'm here. I hope you'll join me. But today I cry. We're devastated. I need myself to feel every aspect of it. And if you want to DO something, make your own heart sing and your own soul dance. That would be the Best Present Ever. Love it forward. As always our men bring me comfort, so whenever I have siome energy, I visit LJ and enjoy your stories. I miss them. I miss writing about them. After the surgery I've been living in a fog, but that lifted. Yesterday the stiches were removed and that was plain hell. Extremely painfull. The wound was a little infected, so I have some meds to help with that, but they make me groggy. And the wound still hurts. Hope to be writing again soon Bye for now. Our friends at VanHansis.net came up with the perfect birthday present for Van and the EVHSTeam is happy to team up and spread the word! 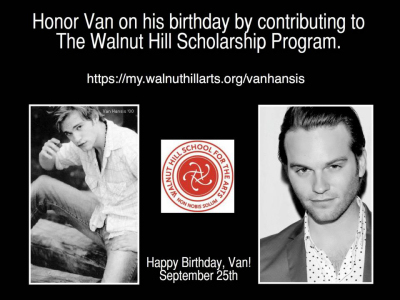 Four years ago Van's fans created a scholarship at Walnut Hill, the school for the arts Van attented and loves. Your donation will be put in a fund that will be available to help students in need with tuition or other fees. In addition, the fund can be used to assist needy students in case of an emergency situation. (For example, if a family emergency arises and the student does not have the money for a plane ticket to get home, this fund can assist them). Your name will be listed and made available to Van. As you know, I’m on a break. I needed some time to collect my thoughts and to make some difficult decisions. Because as much as I loved writing the soap, publishing it on three different locations on the web took a lot of my time and energy. So this Monday I will publish a new chapter as promised, but not here. Of course I hope you will find your way to the other location, but if you decide not to follow, please know I have appreciated your support and comments. I will stick around to read (and comment) other stories. I love this community, I really do. But I love my health too and I needed to reduce some of the work. Her blue eyes fired her anger and although the Foster Monster forced himself to shrug, he did lean back into his chair. Increasing the distance between himself and her passionate anger. Luke softly lifted the girl back to his lap and kissed her temple. “He’s been hurt enough…” Zoë muttered and both Luke and Reid tapped her leg. “He has. And we’ll make sure that man will be punished for it,” Reid promised, still in shock. Did she realize what she just did? Danny did. With a ‘yeah yeah, don’t make such a big deal out of it’ shrug she smiled at Danny and then the judge took over again. The minute he looked at Danny, the boy put his hand on his sleeve. That one sentence completed changed Danny’s facial expressions. Horror, fear, pain and disgust showed themselves and the boy’s voice was a small whisper now. “Please…no,” the little hand on the judge’s sleeve was back, but this time with a tight grip. “They will hate me…” he whispered. The tears were back and he pulled Mr. Panda close. For some reason he then looked to the other end of the table. Evil Foster Mom lowered her eyes, but the man next to her smirked at him. I always knew you were a coward. Then Danny noticed something different. A shift. There was a glow behind his Evil Foster Dad and even after he blinked, the light became brighter. Then he smiled. Annie was here. Emily frowned. The camera had picked up all the emotions on the child’s face, but the reason for the change was not clear. “Big time,” Emily responded and her pen flew over the paper. Everybody present in the chamber was wondering the same thing. Everybody but Luke and Reid. They looked at each other and smiled. They knew. Annie was here. Mr. Panda was pulled into a hug again. Danny sighed and then continued. The how-could-I’ve-been-so-dumb’ expression was back. So were the tears. “When Jeffrey stepped into the house, I knew I did wrong,” Danny kept his eyes on the panda. Obviously too scared to watch the reaction on the faces around him. The calm voice of Curt Jessup prevented the boy from losing himself in the memories. “I had to touch him…like the men had touched me…” Danny was crying now, but forced himself to go on. He could feel Annie behind him, encouraging him. Soothing him. Comforting him. Again the tumult in the courtroom reached the chamber and the judge decided it was enough. “Is Jeffrey okay?” this whisper was even softer. “He’s not?” Surprise was all over Danny’s face. “Good,” Danny nodded. The obvious avoidance of looking at his fathers was painful and judge Jessup nodded at Reid and Luke. Before the boy could do anything, he was lifted to his father’s chest and he heard Reid’s soft voice in his ear. Saying the three words he really didn’t expect to hear. Danny leaned back a little so he could see his dad’s eyes and started crying when he saw the love. He then felt another hand on his back and without leaving Reid’s arms Danny threw himself around Luke’s neck. “My beautiful boy,” Luke whispered in tears, “You’ve been so brave.” Brown eyes met brown eyes and again Danny looked surprised by the love in it. Zoë was silent, but her hand was on Danny leg and her smile was bigger than usual. When the kids looked at each other they just nodded. They didn’t need words. They all looked up when the two defendants were escorted out. For a moment the woman hesitated. She looked sad. While Luke was lifting Zoë back into her wheelchair, Reid and Danny looked at the Foster Mom from Hell. For a moment their eyes met. Reid narrowed his and Danny turned his head away. Finding solace in the warmth of Reid’s neck. She nodded, as if she knew this couldn’t be fixed. Not now. Not here. When they stepped back into the courtroom, the family were visibly surprised by the applause that grew into a standing ovation. Admiration and support reached Danny as a tidal wave. Showing him he was loved. Surprise, shyness and sheer relief entered the boy’s eyes and when he saw the familiar faces of the Snyders, he even smiled. “Now the hell is really over, Daddy,” he whispered in Reid’s ear and the doctor pulled him very close for a moment. Reid looked next to him and Luke’s radiant smile made him almost choke up. He maneuvered Danny on his left arm and put his other arm around his partner. Surround by family, friends and strangers they kissed. Short and firm, but also loving and telling. Another chapter closed. Another crowd, but this time Reid felt quite comfortable. So far dinner had been great. Lucinda had gone beyond her promise. Not only did the menu show all his favorites, but every dish he ordered was double the normal amount. His kids – he really liked how that sounded – were enjoying their peers in a little children’s section and the special arrangement of tables and chairs gave everybody the opportunity to mingle. Not that Reid was making use of that. He was just fine where he was. Next to Luke, with the blond’s hand on his leg. The agitation in the brown eyes hadn’t gone unnoticed. Neither had the fact that the tension was building. And Reid knew why. It had been an emotional afternoon, but they hadn’t had any chance to handle it with their normal routine: working off steam. “I’m so ready to go home,” Luke whispered with a light blush and Reid grinned. “And so do I,” a female voice came between them and then they both felt a piece of plastic pushed into their hands. While Reid grinned and gave the woman an approval nod, Luke blushed and lowered his head. But rose to his feet anyway. Instead of dragging Reid into the elevator – like the doctor had expected – Luke made his way to Danny and whispered something. The boy looked at him for a moment and then nodded. After ruffling the blond locks and the reddish curls he blew the kids a kiss and followed Luke into the hallway. The minute he reached him, the elevator doors opened and with a quick pull he was launched into the small space. Time to worry about it was lacking. Luke’s lips catapulted him into another dimension and he hardly noticed they moved out of the elevator into the room. All Reid knew and felt was Luke. He vaguely felt he was pushed against the wall, but then the familiar fingers were on his zipper and he zoned out. Reid cracked the code and before Luke could lower himself, Reid caught Luke’s face between his hands and made him look at him. They smiled and then the need, the aggression, the fire was back. Many, many times they’d made love. Taking their time, taking it slow, taking it tender. This was not one of those times. Luke didn’t even ask this time. He stated. “Wouldn’t have it any other way, Luciano,” Reid grinned in a daze and let Luke take over. "You guys need a break.” Lucinda's voice echoed in Reid's head and the last thing he consciously wondered was if their activity would officially be considered ‘taking a break’, but he then concluded he didn’t care about the public opinion. As far as he was concerned, this was the best break he ever had. I hope to welcome you all back on Monday, July 30th! Thanks for all your support! It had been the major talk of the town, these last weeks, and even in Oakdale this was something else. Kidnapping, murder, people returning from the dead... that didn't startle the average Oakdalian anymore. But child abuse? That had their blood pumping and the courtroom was packed. There had been rumors and the WOAK van outside the courthouse suggested they were true...today one of the victims would tell his story and although disgusted, they all wanted to hear. What is it in human nature that makes us feel attracted to the horror of others? Emily Stewart looked around. She could sniff out the sensationalists in the room like bad apples in a basket. She could see it in their eyes. They were here to relish the pain of a young boy. So they could judge. Tell themselves and others that they were better than the abusers. But were they? Don't we all hold the responsibility to look after all our children, even the ones we didn't give birth to? Her hand stopped writing when she saw them enter. The buzzing crowd held their breath and only the sound of footsteps and the soft squeaking of a wheelchair filled the air. She felt for them. The doctor looked like his aloof, cold and arrogant self, but whoever bothered to really connect with his energy - and she did - could see his pain. His concern. His need to be strong for his family. He was holding the boy close to his chest. The way the child had buried his blond head in his father's neck was telling. He was obviously very scared, but he'd found safety in the strong arms around him. His other father was pushing the wheelchair. Oakdale's Golden Boy didn't shine today. No radiant smile, no friendly greeting, no sympathetic ear. Emily bit her pen. She'd always liked Luke Snyder, but lately she'd added admiration and respect. She wished she could hug him. He looked like he needed one. She had heard about the little girl, but nothing had prepared her for this confrontation. Her Eliza was beautiful, but this girl took her breath away. Not just because of the reddish curls or the remarkable blue eyes, but because of the strong energy of this child in a cast. Like she could fight the world and come out a winner. The way she looked up to the boy in Reid's arms told the whole story. She was part of this family. Instinctively Emily started writing down her thoughts and when she looked up again the family was passing her. The girl looked at her and frowned. The blue eyes were penetrating and hypnotizing and for a moment Emily felt scrutinized. As if the girl was challenging her. Daring her. To write the truth. To tell the story as best as she could. Emily gave her a quick nod. She would. The Clerk of the Court guided the family to chairs and after some whispered instructions, they stood until the judge entered and then took a seat. Judge Jessup’s telling look at Danny and his family told the hidden meaning of his words. Not that I think they deserve any consideration. Emily Stewart quickly scribbled down her findings. The way Reid and Luke grabbed each other’s hand and squeezed it. The way Judge Jessup softly said something to Danny – the boy even managed a small smile – and gave Reid and Luke a pat on the back. The way the jury looked at Danny. The compassion and the endearment for this young victim was evident. The way the whole Snyder clan was clinging together when they watched their family members leave the room. Their supportive love was tangible. “I don’t envy them,” Paul whispered next to her and she smiled at him. “Don’t even want to think about it,” Paul groaned and Emily nodded. She knew about Paul’s encounter with the male defendant and she heard rumors about Reid’s attack on the female one. It was a small miracle he hadn’t lynched her on the spot. Emily knew she would have. Before her mind could wander off some more, the activities in the judge’s chamber were shown on the screen and all her attention was fixated again. She swallowed as she watched Danny on the chair. His eyes and attention were on the stuffed panda on his lap. Obviously the toy offered some comfort. He didn’t look too worried. But then she realized the defendants weren’t there yet. The boy’s demeanor changed dramatically when she heard people entering the chamber. Judge Jessup’s face was neutral, but the way his eyes flashed to Danny showed her that the man would protect this little boy and she made a note on her pad about that. He had been Oakdale’s judge for a long time, but today would be the day that The Intruder would blow his horn. She wasn’t sure, but that could be a first. She never thought much of the Oakdale Court System, but today she saw integrity. And liked it. When his eyes pinned on the judge, Danny nodded. Emily Stewart smiled and she felt the energy in the room soften. The boy’s answer was both disarming and telling. Everybody present now knew how communication in the Oliver Snyder household was handled. Tell me how you feel, not what you think I want to hear. Judge Jessup was visibly impressed and he gave Reid and Luke a quick smile. And they did. Seemingly emotionless Danny answered questions about his past. He explained how the first week had been okay. There had been two other boys in the house, both older, and Danny shared how he didn’t understand why he wasn’t allowed to spend time with them. “Did you ask?” the judge asked and Danny shook his head. Emily heard some sniffing, but she blocked it out and kept watching the screen. The camera caught a shot of Luke and Reid. Still holding hands. Zoë had been lifted on Luke’s lap and the girl only had eyes for Danny. He lowered his head and quickly looked at the spot where his ‘monsters’ sat. Emily wished she could see their faces. Were they moved, liked everybody around her was? “So Vincent ran away,” Jessup concluded and Danny nodded, focusing on the judge again. Danny had a ‘how-could-I’ve-been-so-dumb’ expression on his face, but when the judge gave him an understanding nod, he raised his head a little more. Danny started to get upset. “That must have been difficult,” the judge said in a friendly tone and Danny nodded. “It would help, but it’s okay if you don’t want to…” the calm voice of the judge filled Emily Stewart with respect again and she made a special note of his remark. The Intruder would be very complimentary for a change. Danny took a deep breath and lowered his head. Was that a female snort she heard? Emily grinned. Apparently the foster mother resented her lack of cleaning skills to be out there. As if that was her biggest crime. Emily had been in court for the last few days and the picture that was painted by the prosecutor had been very clear. She had done a lot of stuff to be really ashamed of. Not cleaning the house wasn’t one of them. Some tears started dropping down, but Danny didn’t seem to notice. He was back there. In the room. But not for long. The last word made the boy look up and then his eyes found Reid’s and Luke’s. He nodded. He was safe. Again the boy shook his head. For a moment everybody was too shocked to move. It was a little girl who first snapped out of it. She leaned on the table in front of her, looking as if she would crawl her way to the speaker. She lifted herself up and looked absolutely fierce. The huge physical therapist gave him a telling grin. “She’s here for Kevin,” a voice behind him explained and both doctors exchanged nods. “Pretty good, actually. He’s my brother-in-law. My wife’s brother,” Trudy explained. Reid took a silent sigh. What was it about this town and everybody being related to everybody? “Knowing you only accept the best in your hospital, I’m flattered,” her smile was a mix of genuine pride and some teasing and Reid gave her a telling wink. “As you should be,” he snorted and after a quick movement of his hand, he made his way back to his office. It had been a good day, but he was ready to change the stage. “Makes you wonder what that little girl endured…” Chris frowned. Before Reid could answer, the doctor had turned a corner and Reid covered the distance to his office without more distractions. The minute he stepped in, Reid realized he wasn’t off the hook just yet, but this interruption he actually liked. “Hello Grandma,” he teased, giving her a quick kiss on his cheek. After pointing to the couch, Reid dropped in a chair and put his feet on the table. Reid was in shock. He didn’t even know Lucinda was after him. He shook his head for a moment. Of course Lucinda would be after him. This woman was relentless when it came to justice for her family. “Plain logic,” Reid muttered, making Lucinda grin. “Any torture involved?” Reid knew he sounded more hopeful then teasing, but he didn’t care. “There may have been some,” Lucinda shrugged. Reid didn’t even feel like joking at this moment. He just nodded. Reid leaned back for a moment. That was a relief. “Thank god for that,” Reid signed and Lucinda nodded. The way Lucinda turned a little pale, worried Reid immensely. That bad? “Give it to me,” Reid urged her and she took a deep breath. With a soft moan Reid put his head in his hands. “That’s why she’s not talking,” Lucinda repeated his words. “Let’s hope so…” Reid wasn’t convinced. Reid surprised her by taking her hands in his. Lucinda smiled. How she loved this man and how she loved that he loved her grandson. She had watched Luke’s involvement with Noah with growing concern and disapproval and she had even started thinking up ways to run the barista out of town. In hindsight she was happy she hadn’t interfered. Knowing Luke, he would have stayed with Noah just to make his point. She’d thanked her lucky stars when Lily started talking about ‘some guy in Luke’s life’ and because Lily’s recital of the doctor’s bad reputation had concerned her, she’d ordered a background check and found out something very interesting about Dr. Reid Oliver. She could even recall her meeting with the detective word for word. ‘Excuse me?’ How could anyone his age have no life? For a second it had worried her, but then she had realized something significant. All this time nothing and nobody had been able to distract Dr. Reid Oliver from his work. But somehow her Luke had managed to catch this guy’s attention. And no, she wasn’t surprised. With Luke’s charisma he could charm a polar bear into buying some ice cream. But it did mean Luke was the exception to the rules of Dr. Oliver and Lucinda liked that. It suggested something big was going on. Something special. And boy, had she been right about that. They were still holding hands and she squeezed the long fingers carefully. “I’m grateful I could deliver some answers,” she softly said. “I guess it’s that kind of week,” Reid sighed and Lucinda nodded. “We’ll need all the support we can get,” Reid sighed again, not looking forward to the day to come. “You understand me so well,” Reid grinned and even let himself be pulled in for a short hug. “You’re doing a great job,” Reid convinced her and she laughed. After Reid nodded she left him alone and after a quick glance at his watch, he grabbed his coat and bag and made his way to Gwen’s office. Home. Luke. Two words that made him smile and fasten his pace.